It’s comforting to know, in this age of endless celebrity endorsements and autobiographies, that there are solid historical precedents for people cashing in on their fame to sell merchandise to their adoring public. Recently, I came across Strength: and how to obtain it (1905.7.339), a book which probably wouldn’t have grabbed my attention, had it not been for the (very) scantily-clad man on the cover. This was to be my introduction to the world of Eugen Sandow, body builder extraordinaire. All but forgotten today, Sandow was, in his heyday, celebrated on both sides of the Atlantic for his physical prowess (at the relatively modest height of 5’9”, his chest, when expanded, measured 62 inches), and later on in his career he created a sizeable business empire on the strength of his name. Born in Prussia in 1867, Sandow shot to fame in 1889, when he took on a wrestler named ‘Cyclops’ in a display of strength at the Royal Aquarium in London, and won. (This culminated in Sandow heaving weights of 250 lbs above his head a full seven times.) Cyclops was the protégé of Charles ‘Samson’ Sampson, who billed himself as “the strongest man on Earth”; in a subsequent contest between Sandow and ‘Samson’, Sandow emerged victorious again, and established himself as a box-office draw, as people flocked to see him show off his physique. He spent much of the 1890s in America, selling out shows there, but as his appeal dwindled he returned to London, where he began to develop the Sandow “brand”: in addition to writing books and pamphlets on “physical culture”, he published a magazine, designed and sold exercise equipment, and brought out his own type of cocoa. In 1901, he was immortalised when a cast of his body was taken for the British Museum. Not all of these ventures were successful – the cast was attacked by critics as “a monstrosity”, and his cocoa business went bankrupt in 1916 – but he was undeterred by failure. Strength: and how to obtain it, is a guide to fitness, illustrated by countless photographs of Sandow, dressed only in leopard-print underwear and flexing his muscles. It’s also part autobiography, including as it does the section on ‘Incidents of my professional career’, which is a rather drab (and sanitised) version of his professional achievements. 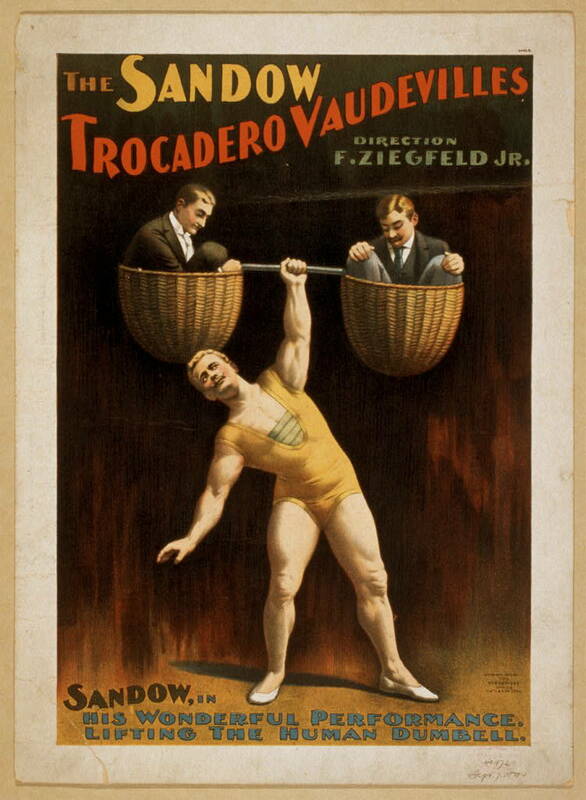 There are plenty of advertisements for Sandow merchandise, ranging from Sandow’s Symmetrion for ladies (“fulfils all woman’s requirements for producing symmetry of figure, grace of carriage, perfect health”), to his latest work, Body-building, or, Man in the making, containing exercises which will apparently, amongst other things, prevent both appendicitis and liver troubles.